UFC Fight Night 102 takes place Friday, December 9 at the Times Union Center in Albany, and the entire card streams on UFC Fight Pass. It is the first of two UFC cards this weekend. Tomorrow, the UFC 206 pay-per-view takes place in Toronto, Ontario, Canada. 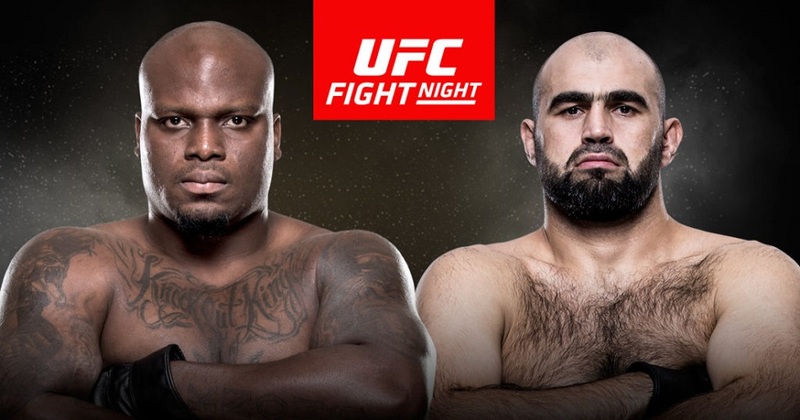 A heavyweight bout between Derrick Lewis (16-4) and Shamil Abdurakhimov (17-3) headlined the card. It was not the best performance of the night but ‘The Black Beast’ Lewis earned his fifth straight UFC win with a fourth round TKO win over Abdurakhimov. Francis Ngannou defeated Anthony Hamilton via submission (kimura) in less than two minutes. Ngannou basically dragged Hamilton down to the canvas, torqued his arm backwards while applying knee on belly. Color commentator Brian Stann was stunned stating that just four years Ngannou did not know what MMA was, but tonight seemed as if he had been doing it his whole life. Corey Anderson promised he was changing his ‘Beastin’ 25/8′ nickname and tonight the new name was unveiled. Anderson will now go by ‘Overtime’ which he says is just a different play on the last. ‘Overtime’ put Sean O’Connell away via TKO tonight in the second round. Saparbek Safarov vs. Gian Villante had a crazy start as UFC newcomer Safarov was cut open in the opening seconds of the first round. He was bashed and bloodied, his knee gave out twice, yet he still kept coming back and managed to knock Villante down. It was as if Safarov refused to be put away. In between rounds Safarov’s face was bloody and his eye was a complete mess, shades of black and blue. Doctors took a look at his leg but he was allowed to continue. In the second round the fight was called by referee Keith Peterson. Villante was declared the victor via TKO. Ashley Yoder made her UFC debut tonight after falling short on the Ultimate Fighter and heading down to Invicta FC where she most recently fought three weeks ago. Yoder took tonight’s fight against Justine Kish on short notice, unfortunately she came up on the losing side of a decision. Randy ‘Rudeboy’ Brown impressed fans in attendance with a second round TKO victory over UFC newcomer Brian Camozzi. Brown said he was suffering from mold poisoning in his last fight. He asked to take part in UFC 208 in Brooklyn, New York, in February. Shane Burgos made his UFC debut after going 7-0 on the outside. Burgos comes from Cage Fury Fighting Championship and took the fight on short notice. We spoke with Burgos just weeks ago where he asked to put on the card. Sure enough, his phone rang. Burgos was the bigger fighter when he stepped inside the octagon with Tiago Trator which is quite impressive since the fight was at 145 pounds and Trator at one time competed at 205 pounds, four weight classes up. This was an incredible fight with fans on their feet from bell to bell. Never before have I seen a fighter have their hair cut in between rounds but that is exactly what happened when Burgos’ cornerman cut off his pony tail before the start of the third round. Burgos showed impressive striking and won decisively on all scorecards moving to 8-0. It was the first time in his career that he went the distance. No love was lost between Marc Diakiese and Frankie Perez who got into an altercation at yesterday’s weigh-ins. Diakiese decisively won rounds one and three while Perez won the middle round, cutting Diakese wide open in the process. After the fight Perez threw a punch after the bell and yelled a few expletives as he was visibly frustrated. A strawweight bout between UFC newcomer J.J. Aldrich and Juliana Lima opened up the fight card. Lima earned scored decisively in each of the three rounds to win on all three judges’ scorecards, 30-27.